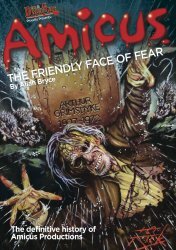 Amicus - The Friendly Face of Fear tells the complete story of Amicus's 20 year creative period, starting with 50s rock musicals and charting its rise through Dr. Who movies and horror anthologies and prehistoric fantasies like The Land That Time Forgot. 166 pages profusely illustrated in full colour throughout, with never-before-published stills, posters, lobby cards, flyers, candid photographs and unused artwork, this lavish book is the definitive history of this major independent studio, and every horror fan's dream. During the '60s and early '70s, Britain's Amicus Productions were one of the world's leading makers of cult sci-fi, fantasy and horror movies. It's easy to confuse Amicus with their better known genre rivals Hammer Films because both studios used many of the same people in front of and behind the camera, including the likes of director Freddie Francis and genre giants Christopher Lee and Peter Cushing. 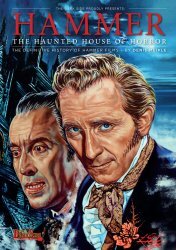 But where Hammer specialised in the Gothic horrors of Frankenstein and Dracula, Amicus was more contemporary in approach and mainly known for its trademark anthology horror films such as Dr. Terror's House of Horrors and Tales From The Crypt, originally inspired by the 1940s Ealing Studios classic, Dead of Night. Don't have the companion volume Hammer: The Haunted House of Horror? Use the convenient Buy Both button below!